The graph is federal surplus (up) or deficit (down), not counting interest costs, divided by potential GDP. I made it for another purpose, but it is interesting in these fiscally ... interesting .. times. Taking interest costs out is a way of assessing overall fiscal stability. If you pay the interest on your credit card, the balance won't grow over time. Granted, interest costs are increasing -- 5% times a 100% debt/GDP ratio is a lot more than 5% times a 30% debt/GDP ratio, and interest costs threaten to crowd out much of the rest of the budget if interest rates go up. But still, as an overall measure of fiscal solvency, whether one way or another you are paying interest and then slowly working down debt, or if you are not even making the interest payments and the balance is growing over time, is the relevant measure. I divided by potential rather than actual GDP so that we would focus on the deficits, and not see variation induced by GDP. If GDP falls, then it makes deficit/GDP larger. The point is to detrend and scale deficits by some measure of our long-run ability to pay them. Yes, deficits after 2008 are even larger as a fraction of actual rather than potential GDP. So this is the conservative choice. Now, comments on the graph. Once you net out interest costs, it is interesting how sober US fiscal policy actually has been over the years. In economic good times, we run primary surpluses. The impression that the US is always running deficits is primarily because of interest costs. Even the notorious "Reagan deficits" were primarily payments, occasioned by the huge spike in interest rates, on outstanding debt. On a tax minus expenditure basis, not much unusual was going on especially considering it was the bottom of the (then) worst recession since WWII. Only in the extreme of 1976, 1982, and 2002, in with steep recessions and in the later case war did we touch any primary deficits, and then pretty swiftly returned to surpluses. Until 2008. 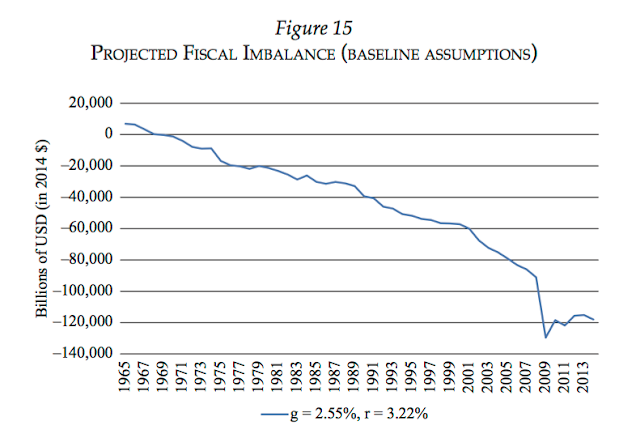 The last 10 years really have been an anomaly in US fiscal policy. One may say that the huge recession demanded huge fiscal stimulus, or one may think $10 trillion in debt was wasted. In either case, what we just went through was huge. And in the last data point, 2017, we are sliding again into territory only seen in severe recessions. That too is unusual. Disclaimer: All of these measures are pretty bad. Surplus/deficit has lots of questionable reporting in it, and the interest cost only has explicit coupon payments. I thought it better here to show you how the easily available common numbers work than to get into a big measurement exercise. I'll be doing that later for the project that produced this graph, and may update. Update: Sometimes a blog post makes a small point that can easily be misinterpreted in the broader context. So it is here. Here, Jeff adds up the promises made each year for spending over the next 75 years. Others, including Larry Kotlikoff, make the same point by discounting the future payments, to estimate that the actual debt -- the present value of what the US owes less what it will take in -- is between $75 trillion and $200 trillion -- much more than the $20 trillion of actual GDP. I've been one of those guys wandering around with a sign "the debt crisis is coming" so long that I forget to reiterate the point on occasion, and Jeff rightly points out my graph taken alone could be so misinterpreted. In a nutshell, the problem is this: The US has accumulated a huge debt. Interest costs on that debt are already in the hundreds of billions per year. If interest rates rise, those costs will rise more. $20 trillion of debt times 5% interest rate is $1 trillion extra deficit, or even faster-rising debt. Unlike the case after WWII, when the spending was in the past, the US has also promised huge amount of spending in the future. And, as Jeff points out, this did not start in 2008. Entitlements have grown and crowded out regular spending. Now they are growing to crowd out interest payments. Soon they will grow more. As you say, 2017 is "new." Running primary deficits after 10 years of economic recovery. And soon to get worse? Curiously, three different regional Fed bank studies suggested QE is not inflationary or even deflationary. QE as ace in the hole? Will the US dance the Japan? Since I also think QE had no effect can you point to those studies? Stephen Williamson's safe asset shortage models can produce this kind of result - if reserves are "better collateral" than long-term bonds, swapping reserves with bonds eases collateral constraints, lowers the liquidity premium on reserves and short-term bonds, which means lower inflation for a fixed nominal interest rate. What a quite great discussion about the economic , is getting grumpy, then you had discuss how it comes about the inflation or even defiationary. And in the last data point, 2017, we are sliding again into territory only seen in severe recessions. I am a retired lawyer. I used hear this kind of talk from insolvent debtors all the time. Subtracting interest costs is just plain ridiculous. The interest is the one thing that does get paid. The US Government, because it runs the printing press will continue to make payments. But it will be in evermore worthless currency. There is no reason to be complacent. Controlling inflation in the future is straightforward: An aggressive across the board increase in taxes - income, sales, and asset value. That would cool things off pronto. Venezuela! Are you listening? I was hoping someday a real economist would ask. Then we have the Dallas Fed team and they posit that QE buys assets that back currency, like the Deutschen Rentenback after Weimar Republic. BTW, the QE can be permanent, no matter, says Wen. Now, I am just a wag who took a lot of econ through grad school and has followed macro for the last 40 years. I really like the topic. But what to believe when three Fed regional banks come out with studies that say QE is not inflationary or even deflationary? Then it is obvious we will see an ocean of federal red-ink going forward. I do not know what would reverse that outlook. So…in Japan the BoJ owns 45% of the JGBs, and they are struggling to get to 1% inflation, and will almost certainly their 2% target again in 2018 (the yen is appreciating). Japan has a lower unemployment rate than the US, by some metrics 1.5 job openings for every job hunter, roughly the reverse ratio of the US. Japan has much better property zoning. This might be a huge sleeper issue. So, the Fed should engage in perma-QE and hold rates down as does the Bank of Japan (they buy JGBs if rates get above zero)"
I call that mobius-strip economics. The national government owes money to itself (if you regard the central bank as part of the national government). Hey, Reagan wanted to move the Fed into the Treasury. Maybe he know more than he let on…. Yeah, ok. I guess I don't understand why he's leaving out interest payments then. He seems to imply in the credit card paragraph that as long as you run a primary surplus your balance won't increase but clearly it is. I'm guessing I'm misreading that paragraph. It is a mistake to leave out interest. On the other hand, the difference between nominal and real rates can also distort the picture. It might be interesting to look at a revised chart with an allowance for real interest at, say, 2% rather than the actual nominal rates that were in effect from time to time. In terms of entitlement spending America's choices are: (1) let granny die; (2) find a way to make healthcare substantially cheaper; or (3) pay higher taxes. I object to lumping social security and Medicare along with Medicaid, pensions and other under the heading of "entitlement programs". The former are funded by contributions from workers and employers. They may be underfunded but that is a different problem than the latter which are unfunded by the potential recipients. These are different problems and require different solutions. This mess has been building over 85 years of political mismanagement and it is unreasonable to think it can be solved overnight. However, the first step in the solution to create a true separate trust for the premiums that the politicians cannot tamper with. Next, increase "premiums" to appropriate actuarial levels so that retirements are being funded by the retirees themselves, not new entrants into the job market. That doesn't do anything about current recipients, or even people within a few years of retirement who do not have sufficient working time to "recover" earlier shortfalls. There would have to be a phase-in where people new to the system would contribute 100% of the correct premium and others would have smaller increases to reflect their proximity to retirement. Over time, that part of the problem would tend to repair itself. I am not implying abandonment of those who are unable to contribute enough or any to their own retirement. That is more complex and there is no simple answer. However, a true retirement security trust inviolate by politicians is essential to seeing the magnitude of the problem. Here is my question for you (or other capable analysts). How much of the imbalance is as a result of the knot of baby boomers currently working its way through the system. To what extent will the issue self correct over time as they die off? Congratulations to you. Hardly anyone notices what you have pointed out. Other nations segregate national pension plans from the national budget, and indeed the US did until LBJ, who in 1968 clumped Social Security into the national "unified budget." Social Securty and Medicare are funded primarily by onerous payroll taxes. Of course, with an aging population, this makes it appear the national legislature is allocating more to social welfare programs. I happen to favor reductions in both "welfare and warfare" spending, as David Stockman puts it. We have runaway "national security" spending. The US now spends about 50% more on national security than it did at the height of the Reagan military build-up, when we faced a bona-fide military adversary in the form of the old Soviet Union. Today the enemy is stateless punks sans air forces, or navies or mechanized armies. A much, much smaller threat. We are getting close to spending $200 billion a year on a retirement-social welfare program, with full medical benefits provided in public hospitals, for former federal employees who worked for 20 years on the public's dime. That is the VA.
BTW, at current rates, military spending will double in the next 10 years. To reiterate, I am happy to cut social welfare spending. Sheesh, eliminate HUD, Commerce, USDA, and Education Dept. for starters. Side note on federal debt charts: When the Federal Reserve buys Treasuries, is that debt still considered "held by the public"? Why? Can you guess when fiscal responsibility broke down? Also excellent question. I think in the next recession, government-bond interest rates hit zero (they are at zero already in Japan and Germany). So should the US issue as much very long-term zero or very-low interest debt as possible, and re-fi existing debt during the next recession? Causality in voter minds is important. It is important that all lovers of liberty give a consistent message. In the past (maybe up to about 1970) we were pretty responsible and then we used up all the borrowing a large, world beating economy, is allowed by the market in last 10 or 20 years. I wonder if Obama was surprised that spending money he didn't have was never an issue and he had low inflation and low interest rates? Now Jerome Powell and Trump are probably going to have to start dealing with the fallout. If the voters don't get the causality right, we may end up like Britain in the 50's or worse. If you had a printing press in your basement which can print $1,000 bills, would you worry about your Visa bill? OK readers. Is DoDeals a bot? Right on the line of incoherence that suggests a pretty good AI program, and multiple postings within a few minutes suggest so. I get a lot of hilarious spam on the blog by the way. What do you think? I don't think DoDeals is a bot. DoDeals comments on the MMT link he or she provides look like those of a real person. The incoherence is a consequence of attempting to explain MMT. Do I look like a bot to you? Really? Why don't you try to refudiate my "incoherence". "The Treasury no long owes you the money; now it is the Federal Reserve that owes you the money on the same terms as to interest and maturity"
makes the Federal debt disappear. It makes the Treasury debt disappear but now the Federal Reserve owes $20 Trillion and I expect those former bond holders will expect the Treasury to guarantee the reserves. Really? A bot? You won't put together a coherent response to my comments - so I'm a bot. Please don't be a snowflake professor. (What did you mean by "humorous" in your self description by the way?) What a Grump! Sorry for the implication -- a response means you're human. I wade through about 50 spam messages a day, some of them rather clever. I'll run a post of funny spam some day. I think DoDeals is real. There are issues where it might behoove someone to run bots. For example, mercantilist China might run bots advocating "free trade." Russia may have run bots saying, "Trump is great!" 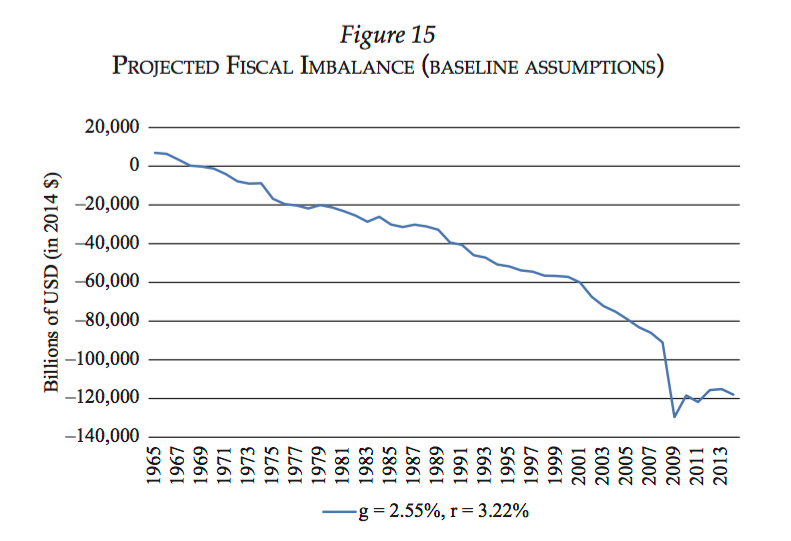 But all political actors today seems happy with larger and larger federal deficits. They do not need to run bots. Everyone agrees deficits do not matter. I'm about as real as a dog gets! Did you notice how nobody even attempted to refudiate my assertions? OK, everyone, I apologize again for insinuating that DoDeals might be a bot or spam. (There is a lot of human created spam that flows in to a blog.) Let's leave that alone. DoDeals, you may notice throughout the comments section that attracting responses requires a certain level of coherence in the argument, and if you are not attracting such responses perhaps clearer arguments might win a response. Having apologized, I'm not going to take any more comments on whether DoDeals is or is not a live human. Dude! I'm a dog! Get over it. DoDeals does raise an issue: if QE does not cause inflation, then why not reduce the national debt by having the central bank buy it back? "Reducing the national debt" in this way is just an asset swap. The reason QE does not cause inflation is because you're swapping essentially isomorphic (reserves pay interest!) government liabilities without withdrawing any of the fiscal backing coming from the government's assets/income. The moment you try to do QE in an institutional structure where people interpret it to mean that you will reduce future real primary budget surpluses, you will get a big inflation. In fact, even if reserves don't pay interest, in a frictionless environment where reserves are abundant, trying to swap government bonds with reserves is only going to drive the nominal interest rate on government bonds to zero and the two assets will end up being equivalent again. With no scarcity of reserves, you're always at the Friedman rule optimum, no matter whether reserves pay a nominal interest or not. If "reducing the national debt" does not amount to reducing the budget surpluses the government is going to run in the future, then it's an accounting trick with no real effects. John and Ege: reserves pay interest...and pay negative interest in Japan! I a m not convinced that there must or even should be IOER. Banks will not extend to loans unless it is profitable to do so. In contrast, presently we are paying banks not to extend loans. Far be it from me to suggest that this represents an example of industry capture of a regulatory body. Add on: Also, we are buying into the idea that a central bank must operate through primary dealers, and then must place reserves into commercial banks, when it buys bonds. I never fully understand this imperative. Why not have the Fed set up a bond-buying desk, digitize money and buy bonds directly? I get it that decades ago perhaps the primary dealers had the resources, market knowledge and expertise that the Fed lacked. Surely today, with such large and liquid financial markets, and so much information publicly available, this is no longer the case. If the Fed merely bought bonds (how simple!) you would not have this Rube Goldberg set-up of reserves, primary dealers and commercial banks. Which again, far be it from me to say, seems designed to generate fees for the financial industry. Okay, so the Fed buys back US IOUs and no reserves are created. I wonder if this is legal. "U.S. lets China bypass Wall Street for Treasury orders"
Okay, so the Treasury does not have to work through primary dealers when selling debt to China. How about another carve out? The Fed does not need to work through primary dealers when buying bonds? Sorry, one more note: "Until the 1970s, unsuccessful offering of (Treasury) bonds and notes were common and the Fed had to be net buyer of last resort." "Today the central bank makes sure the primary dealers have the funds they need to ensure a successful Treasury auction." Egads, the Fed used to buy bonds straight from the Treasury, which would, of course, effectively avoid the bulging excess reserves problem also. The more I read, I get the sense the US central banking-federal budget-monetary stimulus-commercial bank rig-up is something like a tree grown in cramped quarters in toxic soil. Would anyone design a system like this from scratch? Prof & Ege: Why is the Federal debt a problem. If it makes you nervous, fine - replace it with Federal Bank Reserves. Do you pay interest on reserves, fine, keyboard the payments. Will it cause inflation? - First of all who determines interest rates? (Who determined oil prices in the 1970s and 1980s? Saudi Arabia) The fed is the Saudi Arabia of money and interest rates. If the Fed wants low rates it can have them. - Second - Inflation - easily controlled by 4 techniques but taxes is the most effective. Equitable across the board increase in income taxes, VAT, and asset value. Boom. Inflation back down to zero. My point, made to John Cochrane (and Ege), was rather copiously and poorly made. But it is this: The Fed does not have to create reserves to buy bonds, and even if if does create reserves, there is no obligation to pay interest on reserves. In the past. the Fed simply bought bonds from the Treasury. So, it is not a law of physics, nor Constitutional law, that prevents the Fed from conducting QE without creating reserves. It is merely current statute and regulation. On a practical level, the Bank of Japan actually "pays" negative interest on reserves, and has been for many years. So the question still stands: The national debt can be paid off through QE. They are doing so in Japan without inflationary result. Indeed, they cannot seem to hit a 1% inflation target. So today, the US faces a tidal wave of debt, and zero resolve to pay it down (quite the opposite). Preaching fiscal responsibility is a dead end. So now what? We can the way of Greece, Argentina or…Japan? Benjamin, there's indeed no law of nature which says the Fed must pay interest on reserves. If they stopped paying interest on reserves, then that would just drive Treasury yields to zero. If they paid negative interest on reserves, it would drive the yields on Treasuries to be negative. You can't back nominal government debt today by promises of seignorage in the future if you're at a Friedman rule outcome. See John's paper (https://faculty.chicagobooth.edu/john.cochrane/research/papers/Cochrane_money_as_stock_JME.pdf) and look at the equivalent ways of writing the government debt valuation equation. Japan is *not* paying off its national debt through QE. They can swap government bonds with yen balances at the BoJ all they want, and if the government abandons "fiscal responsibility" you will still get inflation. In addition, I also don't understand what you mean by "The Fed doesn't have to create reserves to buy bonds" - are you saying that they can instead create currency? DoDeals, I think the above explanation should answer some of your questions as well. Ben: You can call me Do. - How does the Fed buy bonds without creating reserves? Even if they buy from Treasury? Egg: I don't think so. RE: "... They can swap government bonds with yen balances at the BoJ all they want, and if the government abandons "fiscal responsibility" you will still get inflation. ... ..."
• Haven't they abandoned "fiscal responsibility" (whatever that means) a long time ago? So where is the inflation? RE: "... unexpected inflation *is* sovereign default ... ..."
• So? Announce it 6 months ahead of time so its expected. RE: "... the government's liabilities are backed by the government's assets ... ..."
• Really? What assets back up the US govt debt? Do bond holders have a lien on it? RE: "... "reduce the national debt" without creating unexpected inflation ... ..."
• Controlling inflation is easy enough (although inflation fro an external shock is a bit more complicated. But why would you get inflation? If you replace bonds with Reserve deposits, why do you get inflation? You can call me Do. Ege: See these Fed papers below that say QE is not inflationary, in part as it buys assets that back currency (the Dallas Fed paper). Fiscal responsibility in Japan? They run deficits and never balance the budget either. Yes, the Fed has, in the past, bought bonds straight from the US Treasury, bypassing the convoluted primary-dealer and commercial banks claptrap. I will say it again: The Fed does not have to create reserves as commercial banks to buy bonds! It can buy directly from the Treasury, and occasionally did all through the postwar period into the 1970s! This is historical fact, not theory! Moreover, the Fed could set up its own bond desk and just buy bonds on the open market and bypass the primary dealers. It is only convention that requires the Fed buy bonds from primary dealers, and in the process create reserves. Monetizing the debt in times of low inflation, no inflation, or deflation, is evidently an option. R is real rates, g is growth. Shows how the primary balance is paramount, but also that debt can grow via the first term as well. Since your graphs show only a modest role for the primary surplus term, the r-g term must be driving US debt growth. 1) Unemployment as in keep it at ZERO at all times. 2) Inflation - as in keep it at a low comfortable level so folks don't stress out. - When you have a printing press - you don't worry about the debt, interest et al. - When you can - tax, spend, buy/sell securities, and manage interest paid on reserve deposits - you don't worry about inflation. You manage it. Even simpler. new debt = interest charges plus deficit. The two are about equal, approaching 800 billion each. It is an impossibility,and in fact, it is about 2% more in GDP than was expected a mere year ago. We cannot switch 2% of GDP on demand in one year. I'm sorry it's not on topic but I'm studying macroeconomics and I really need to know the answers. I asked my teacher but she just repeated exports were cheaper. I don't call her professor because she just reads books in class; she's never analyzed real-world event even if there are some in the text book. I'll appreciate your help. Thanks. It didn't. Fixing a nominal exchange rate is a form of sovereign monetary policy with no real effects past the short-run. Yes, prices did adjust. No, even if prices do not adjust that doesn't mean you get a trade surplus out of a devaluation. China "took advantage of exports" the same way that basic trade models say they should have. The reason for the large Chinese trade surpluses had little to do with Chinese monetary policy - most of it was caused by the inability of the Chinese financial sector to channel domestic savings to productive domestic investment opportunities, which meant they shipped the surplus abroad in exchange for IOUs from rest of the world. No, this does not have anything to do with the PBoC. If the PBoC exchanged its holdings of foreign currency assets for renminbi balances tomorrow and wrote off the balances off its balance sheet, all you've done is allow people to hold foreign government bonds (and the associated exchange rate risk) directly instead of holding reverse repos and other deposits at the PBoC through a depository institution. "Exports were cheaper" is a common argument among people who don't understand accounting identities. There's nothing about cheap exports which forces a country's citizens or government to save more and to invest more abroad than they would otherwise. If there were no net flow of financial assets between China and the rest of the world, would "cheap exports" still cause the trade balance to shift to a surplus? There seems to be a pattern of conservative economists (including grumpy ones) worrying about the deficit just after big tax cuts are enacted, starting with the Reagan tax cuts, then Bush's, now Trumps. It's possible that the cure is not to cut taxes so much. A vast majority of Americans want entitlement spending. We are less adamant about taxes. It seems that tax hikes, not entitlement cuts, are the most promising route to a balanced budget. The budget deficit and Federal debt are nonsense stats that don't need to be tracked. We need to track: 1) Unemployment as in keep it at zero, and 2) Inflation, as in keep it under 5%. We will handle the debt the same way we did in 1932 and 1973, partial default with a resulting period of hyperinflation. But there is no reason for any hyperinflation high than 5%, during the default, if we utilizes the new no arbitrage trading systems. The new tech can default by contract allowing the transfers to bound the hyper inflation. Generational defaults, work if you can avoid the civil war. A long time ago (early nineties) I noticed that there were years where the state and local government budget surplus on national income and product accounts was greater than the the US government budget deficit. So I called the contact number at BEA to ask about this. The response I got, which caused me great embarrassment, was that the state and local government budget surpluses were not true surpluses because they resulted from contributions to retirement plans that were insufficient to cover the increase in pension liabilities. At the same time I had noticed that all it took was one or two years of not increasing current federal expenditures on goods and services to balance the federal budget on NIPA, again though not the true deficit. (These observations were from trying to improve my principles of macro class.) Be that as it may, a lot of the post WWII reduction in the debt to GDP ratio came from inflation. So the question is, can inflation reduce the ratio today? It all depends on what share of the debt is issued in TIPS and whether any unexpected inflation can be produced. The greater the share of the debt issued in TIPS, the less good inflation as far as reducing the debt to gdp ratio. Unexpected inflation only helps to the extent that debt is not issued in TIPS. But why, then, is the FED still trying to increase expected inflation if we are near full employment? They must not be concerned about the debt ratio. Hoping I am not embarrassing myself too much. Good question. But totally irrelevant. The US government debt is not a problem in any way shape or form. In fact, it can be repaid tomorrow without a negative repercussion. That would simply involve replacing government bonds with deposits at the Federal Reserve Bank with similar interest and maturities. The similar or even better risk/reward terms assure no change in investor savings/spending preference or desire to hold dollars. We're not recommending this course of action, just pointing out that it is possible. Is your name Randall Wray? Are you an MMT guy? It is always interesting to note how debt and deficit hawks never suggest raising revenues to cure the problem that so upsets them. It could be done, if performed prudently, without inflicting much in the way of economic pain. But those pages seemed to be ripped out of the hymnal. (b) issuance of a federal bond is for borrowing (liability for asset) or to drain liquidity to enable interest rate setting to enable monetary policy (liability for liability), hence whether “the debt” sensibly describes the federal bond market.